Sorry for being MIA lately my schedule has been very off but I hope I will be able to upload posts again starting this week! Anyhoo... I recently joined the BB/CC cream bandwagon. It is funny because I almost rarely use BB/CC creams since I find their coverage too light and too oily for me. However, last August a friend of mine told me that there is an online shop in Instagram wherein you can order Korean products for less. When I checked it out, I discovered that there was an ongoing 50% sale on THe FaceShop's products! Being the "trying-to-be-thrifty" makeup junkie that I am, I was not able to restrain myself and ordered. It claims to have SPF and has a long lasting effect. Before, I have already seen this product and it got me really intrigued mostly because of the packaging and the pump. Basically, you push the pump and product comes out of the hole in the middle. I was really surprised because the product itself is kind of white but turns a different color and when blended into the skin. 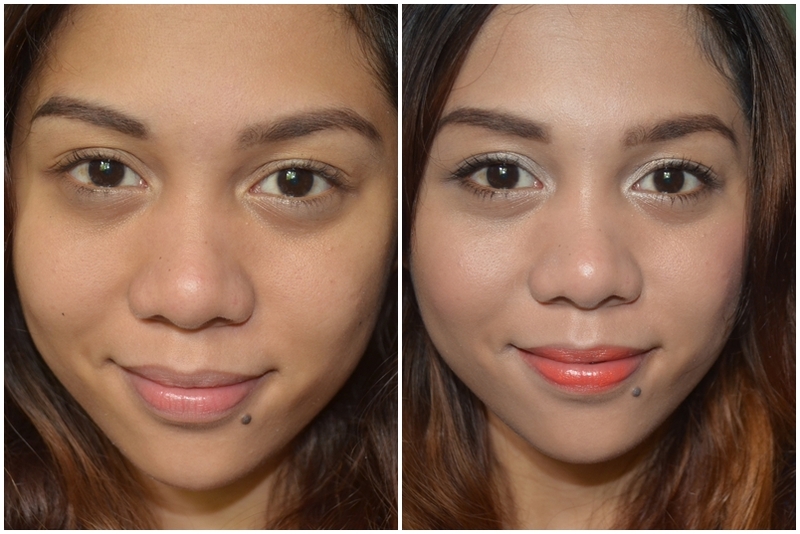 As you can see, you can barely see the product since once you blend it to your skin, it changes in color. It was called "smart capsule" because of its ability to "change" and match a person's skintone. Let me now show you how this baby look on me. Okay.. so I did put some eyebrow powder on. I just think I look more human if I have thicker eyebrows. MAC's NW30 is a perfect match. Here, I used just one full pump and I kind of think that it was too much. At first, I find it difficult to blend, plus the fact that I applied too much, but it really helps if you warm the product with your fingers before applying to the skin. I tried using a brush but it tends to take a while for it to change its color so I think the "warmth" from my hands are better suited for this product. AS you can see, it really looks natural and it did brighten my face. It is not matte but it is not too oily as well. It just gives the skin some sort of glow. If you are not into that kind of finish that you should definitely use a setting powder. Me, after applying the product on both sides of my face. I like how natural the finish is. It also smells like an expensive lotion or something so that's a plus for me. It does have a minimal white cast so it is important to blend the product on your neck as well. As mentioned, it proved a light coverage perfect for daytime or on days when you still want to look put together but you don't want to use too foundation. If you want more coverage then you can apply some concealer on your blemishes. I have tried adding this to my foundation fro a brightening effect. I have also tried applying this first to sure as a primer and it does make my foundation last longer, however, I need to set it with a good powder because it can still make my T-zone oily. All in all, I am quite happy with this product. I actually use it almost everyday since it gives me a really natural finish. But of course, I still use a little bit of concealer on days when I have breakout or super dark circles. I recommend this to those who have the money to spend and to those who have less problem areas on the their face. This is great for school, running errands or for work. That's it for my review! What CC Creams have you tried? Do share on the comment section down below! yes it is...thank you dropping by! CC creamd sounds like a revolution...anyway your skin is perfect so you honestly don't ned it. Awesome review! You have amazing skin - even without the BB cream...I'm a little jealous! I love how it just brightened your face! The result comes across as natural :)) Your skin is gorgeous even without. wow thank you! I followed your blog on bloglovin'! Thank you for dropping by! You'll never know 'till you tried! Good luck and thank you for your compliment! take care!